Event Portable Toilet Hire from Midland Toilet Hire. We provide event sanitation facilities for hire at events, including event portable toilet hire, disabled portable toilet hire, urinal portable toilet hire, trailer toilet hire theses could be either a basic trailer unit or a luxury toilet trailer suitable for a wedding or a VIP. urinals, shower unit hire and hand-wash stations across the Midlands. When thinking of organising an event one of the most important aspects to consider is your guests comfort and peace of mind that the services provided for them will be of the highest quality. As well as Event Portable Toilet Hire, We are also able to assist with fencing for the perimeter of your event to keep out or even keep in your guests. Event Portable Toilet Hire from Midland Toilet Hire – The main focus of our company is to provide a high standard of cleanliness & hygiene in all our event portable toilet products and services carried out by Midland Toilet Hires own vacuum tankers & specialist Event Portable Toilet Hire trained experienced staff. Midland Toilet Hire attendants can be provided to keep event hire toilets in pristine condition if required. If you’re organising an event and don’t know where to start, we can give you advice and help you figure out what you need. Call us on 0800 999 2820 or fill in our contact form. Midland Toilet Hire, Event portable toilet hire Birmingham provides portable toilet hire for builders and work sites across The East and West Midlands and Staffordshire, Warwickshire and Worcestershire. Long and short term portable toilet hire is available. 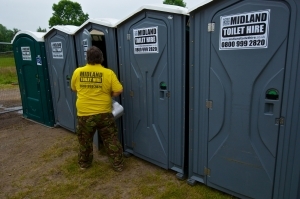 Event Portable Toilet Hire from Midland Toilet Hire.